Sometime in the year 1490, Lorenzo de’ Medici, the de facto ruler of Florence, took notice of a young man working in a trade guild workshop. This, in itself, was not remarkable. Lorenzo was an architect, poet and banker, as well as a politician: he was what is now called a renaissance man. His interests extended to painting and sculpture — nearly all of the civilized arts — and as a connoisseur, he had a knack for spotting talent. What is remarkable, however, is that the precocious young man he befriended was really a child; a boy of 15, and his name was Michelangelo di Lodovico Buonarroti Simoni. Lorenzo offered Michelangelo’s father a position at the palace and proposed that the apprentice join Lorenzo’s family, to be raised as a son and educated with the Medici children. From 1490 to 1492, Michelangelo attended the Humanist academy the Medicis had founded. More importantly, his newfound status now allowed him to consort with poets, scholars, artists, scientists, and philosophers. During his residency in the Medici household, the young Michelangelo kept a journal that he filled with poetry, and he was known to avow that these were the most important years of his life. Lorenzo had created a salon, a scene which formed the epicenter of a new Italian culture, and there is little doubt that this was fueled by money; the Medici were masters of an international banking network, and Florence’s emergent middle class, organized around a system of art and craft guilds, sponsored competitions that rewarded artists for their work. Money sluiced through the streets and piazzas of Renaissance Florence, and yet the sheer hydraulic force of capital did not determine every outcome. Money was a means, but not an end. What mattered most was social interaction in the context of a networked culture driven by ideals, and Burning Man may be regarded in a similar light. One way to fathom this phenomenon is to follow the money. In 2016, Black Rock City will distribute 1.2 million dollars to artists in the form of honoraria. In so doing, it is like the Wool Guild, the Arte della lana, the premier trade guild of Florence. Along with banking, it was one of the two great pillars that supported the Florentine economy, and a significant portion of this wealth was lavished on civic art that was available to every citizen. There isn’t any doubt this institution’s funds derived from the manufacture and sale of high-end luxury goods. Florence’s wealthiest families spent up to forty percent of their income on apparel worn at social gatherings and popular public events. They did this out of family pride and to secure prestige among their peers. That pride, however, overlapped with public spirit — it led to the production of creative work that cradled widespread social interaction; it sustained and enlarged the identity of an entire people, and it is fair to say that without this flow of money there would have been no Renaissance, no quickening of knowledge, no spread of humanist ideals. Bas-relief panel from the door of the Florentine Baptistery, by Lorenzo Ghiberti. Funded by the Wool Guild. This has produced a flow of art that’s issued out of Black Rock City in the form of privately commissioned work, civic installations, and exhibitions subsidized by festivals. Now this surge of money in support of art is going global. 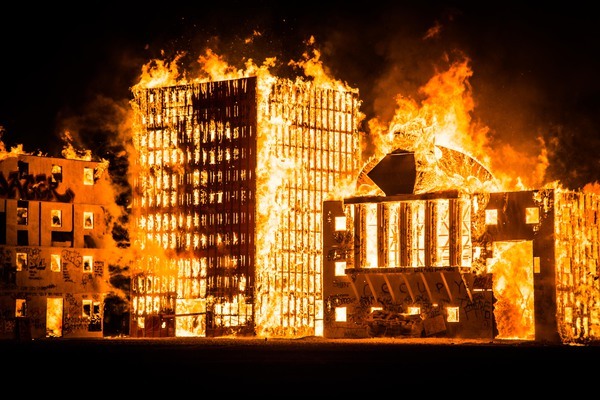 One example is the work of the Temple Crew as led by David Best, with help from the Artichoke Trust, the Burning Man Project, a robust crowd-sourcing campaign, and contributions by a host of public institutions. David’s 21-person crew joined with 98 local volunteers to create a temple in the heart of Derry, an Irish city long-torn by violent struggles between and Protestants and Catholics. According to Artichoke’s website, “Up to 60,000 visitors wrote personal messages…filling the inside with pictures of loved ones, handwritten messages, and symbols of peace”. This was a culture-bearing effort that embodied all of Burning Man’s Ten Principles. Private philanthropy also plays a role in the elaboration of Black Rock City’s culture. As stated in this year’s art theme text, “Over many years, private donors, with a remarkable lack of fanfare, have quietly funded some of the most beloved artworks that have honored our city”. When Lorenzo de’ Medici adopted the young Michelangelo into his family, he did much more than hire on a hand to serve his needs. Private patronage is personal; it is immediate and intimate, and what is true of Florence and our temporary city is also true of every celebrated art scene ever known. One example is the relationship of a famous heiress, Peggy Guggenheim, and Jackson Pollock, a struggling painter. Peggy paid the painter’s daily bills, bought his work when no one else would, and organized his first art show. At a soirée held in her home, she even let him pee in her fireplace (though not on the carpet). Some critics label wealthy Burners as outsiders, but Burning Man has always attracted outliers, adventurers from every walk of life. Amid the ranks of moneyed patrons, many people understand that the essential value of a work of art cannot be charted on a balance sheet. Instead of clutching at a fetishized commodity, they contribute to the ongoing life of art as it moves through society. Moreover, this behavior isn’t limited to rarified salons, such as the scene created by Lorenzo in the Medici Palace. Examine industrial districts inhabited by modern-day bohemians. Here, amid graffitied walls and dumpster treasure troves, one is likely to detect the presence of a trustifarian — a benefactor with a trust fund — who discretely funnels money into artist’s pockets. ‘Burn Wall Street’ by Otto Van Danger and crew. Funded by Burning Man and a substantial contribution by a private patron. Photo by Andrew Wegst. These varied streams of income moving through our city irrigate a fertile social field. Burning Man is an enormous art school, and in this it very much resembles the Republic of Florence and its system of guilds. We ask participants applying for an honorarium to describe their involvement in our community, and these accounts reveal a now familiar pattern. They speak of experience gained from creating art at events within our regional communities. And just as frequently, they describe an informal and spontaneous apprenticeship system. People volunteer to work with more established artists on the playa, and almost inevitably there occurs a seminal moment in these narratives when these applicants declare that they are now prepared to graduate and step out on their own, hastening to add that they have gathered a qualified group of collaborators around them. This churning scene of interaction is fed by one last flood of money, since more than half of the art that appears in Black Rock City is self-funded by participants who don’t receive a subsidy. Expand this category to include Theme Camps, art cars and thousands of impromptu performances, and it is clear that in a society devoted to the giving of gifts, anyone at any time can be both artist and philanthropist. The flowering of Florence in the 15th century produced a new society that valued initiative and creative expression, even as it stressed communal effort and civic engagement. Most of all, this was a movement animated by ideals that citizens of Florence had retrieved from the past. And if we examine our own ideals, as described by the Ten Principles, it is apparent they express this same dynamic balance between individual action and collective identity. Many people think of Black Rock City as a moneyless utopia. By forswearing money during one week in the desert, they feel they’ve found redemption in a fallen world. This ignores the obvious fact that in coming to the desert and preparing to participate, they have spent at least as much in the marketplace as the Burning Man organization spends in creating our city. As evidenced by Florence, civilization isn’t possible without widespread commercial activity. We retreat into the desert every year to contemplate those things in life that are beyond all price, that kind of immediate experience that has an unconditional value: this is why we have suspended commerce in our city. But if Burning Man is to be more than a refuge, and if we believe that it is destined to do work in the world, we should invest our efforts in creating a society that conditions how money behaves. If there is a moral here, it is that money isn’t moral. It is not inherently good, it is not irretrievably bad; it is like water as it tumbles in its pell-mell progress through our world. But money can be canalized by culture; it can be made to serve non-monetary values in a way that’s self-sustaining. This is well illustrated by the history of Florence. Over a span of three generations, a city no larger than our own, with a population comparable to that of Black Rock City, produced a staggering number of geniuses: Giotto, Ghiberti, Brunelleschi, Michelangelo, Leonardo da Vinci — this alone was enough to influence the course of Western civilization for five hundred years. It can be claimed that this was adventitious, the result of historic circumstances that can never be replicated, but it may be that Florence simply got things right. We often say our city is a Petri dish, an experiment devoted to creating culture and community. Perhaps it is now time to take this audacious experiment one step further and begin to imagine a greater and more civilized world. Tagged: 2016 AfterBurn, 2016afterburn-ace, Da Vinci's Workshop, renaissance-series. next You’re Doing It Wrong! Stop Burning Your Art and Start Burning Your Art! a true gift is one that is placed on your door by an unknown benefactor. a true gift of resources carries no strings. if money is a tool, then it is entirely up to the craftsmen to decide what to make with it. a true commision has no parameters, no clauses. i am reminded of diego rivera and his very public spat with rockefeller over the contents of a mural. give the tools away, without a contract to build a particular house, and i’m all for patronage. but do not tell the artist how and when to drink. i think that is of the utmost importance. sorry, i spelled commission wrong. artists are weird like that. The timing of such a maneuver is not a thing done in isolation, under the question of cash flow – but rather the resonance found within the constructive interference of art and society. The chinese believed that art, and intellectuals – were a cost to society, and they often fostered the curse “may you live in interesting times”. I would argue that Larry’s idea is solid here, and that the specific timing of such a move would be within 2017 – and rather, to concentrate in the calendar year of 2016 – the effort within society to re establish the control of those social institutions away from the grip of the arrogant financial elite. The beautiful color and tone of the discussion of funding and its role in society and at the burn is , I believe, further lit by the quiet fact that the Medici responsible was thrown out of Florence two years later by an incompetent ruler, Piero – who played on the fears of a people at once seemingly comfortable with theocracy, and under the guiding hand of Lorenzo – veering away from it – with the incompetent at last having the hand that so simply destroys. Lorenzo was to say , as he was exiled ‘. My desire is that by my life or my death, my misfortune or my prosperity, I may contribute to the welfare of our city… I go full of hope, praying to God to give me grace to perform what every citizen should at all times be ready to perform for his country’ . This essay is fantastic, and points to a good path forward – but it must be said that the path forward goes through a potential idiocracy, which creates many interminable variables, and the resonance and respective assist of the society at large within the timing of such a strategy gives us reason to estimate the proper time as just past that which would cause those who would live by the crystal ball, avoiding the diet of ground glass . The Medici’s though a financial elite, were far less arrogant, and corrupt – and as such, though they were ruthless, How soon is now? For a book-length examination of similar themes, check out “The Gift: Creativity and the Artist in the Modern World” by Lewis Hyde. For me it was life-changing (and I’m not the only one). I just placed your line as lead in a single-page document I’ve been researching and writing for as long as I’ve been Burning. As self-funded artist, some half-dozen installations strong, these ideas have gotten me in trouble since I first rolled in the dust. They’ve also driven the most passionate works of my 45 year professional sculpting career. My carved monuments have blossomed under The Man’s tutelage even as my long-running apprenticeship program has morphed into playa crew ha ha! None would have been, though without money from some kind — very kind patrons. One interaction has been so successful, it proves the theory that berthed it and that experience has by now begat what I’ve called an “alternative funding vehicle” for playa-bound art; monuments designed to later share in Default — and even make the patron some money back, for more art of course. Larry, Da Vinci’s Workshop meshes so finely with my own projects and ideas I just know you must have been listening to my thoughts you rascal…. Don’t believe it? Click my name, read my one page document. I believe it interlaces our creative cauldron in the dessert with Default investment driven by our value(s). I clicked on your name, read your document, and find your Fundiversify model very interesting. If I understand this correctly, it mandates that art move through communities. By doing so, it would seem to accrue both cultural value, as we understand it, and marketplace value, which works as an incentive for the patron to sponsor the artist. That artworks must only be sold at a particular time and place, not immediately gobbled up as part of a private collection, would seem to assure the integrity of this process. It appears to be a hybrid in which private possession and community experience might generously overlap. I can’t say I fully understand the details, but I am intrigued by what you propose. God knows, it’s hard enough for any artist to make a living, and this might be part of a solution to that problem. It certainly responds to the sentiment in my essay, that “we should invest our efforts in creating a society that conditions how money behaves”. And by the way, I am both pleased and flattered that you chose to quote me. Ahhh, the flattery is mine. Thanks for your encouraging note, Larry… You do understand it correctly and I’m happy to fill anyone in with the details. New ideas take some extra attention to understand, but so far there is a prestigious beach-side retreat in South Lake Tahoe who is acting on these. Tahoe Beach Retreat is currently hosting my entire collection of “Fire Inside” monuments on their playa-like public beach, formed by nature of our beloved DG . They hope to include playa artifacts from many more artists on their public beach and 1000′ pier. The Retreat has even been hosting events that feature the sculptures proudly and they’re planning annual art auctions at their state-of-the-art conference center overlooking the beach. They’re also helping me research the formation of a community-based foundation that would hold and distribute funds generated through auction sales, award transport grants and gift supplies and tools to artists. This foundation would also shelter assets and equipment needed to assemble and maintain the “Tahoe Sculpture Garden”. It would even enable a tax deduction. Timeless Keep up the good work ! Creating and curating art is a responsibility that few cities really understand. Making Inviting and supportive space for these possibilities to unfold begins in the political realm. Creativity is the currency of a society , the “wealth of experiences ” it creates is what compells us to live together. BRC exemplifies that desire to create and to experience . Just imagine if every city invited that model of civic engagement. There is more energy out there waiting to answer the call than any one imagines ! Talk about a renaissance . The key element is the participatory space/moment/event which channels proceeds back to the artists . Organizing these events should be a part of every cities mission to define itself as a cultural force. Art is valued by ” the seeing of it” , showing it is the greatest service that can be provided to the artist. The expensive touring shows are only for established artists, and it’s great they can do that. More bandwidth for entry / intermediate is exactly what events like BM provide . Wow. So the theme now seems to be “Greed is good”? Larry did you steal this form the movie Wall Street? How convenient a theme for BM given its shift into openly and vocally relying on large donors and having hedge fund managers on the board. This is the first time Larry has created an art theme, has contribution to the year’s event, whose primary purpose was to generate money. I’m afraid, you just met the definition of selling-out. Sure seems that BM is all about the benajmins these days. I remember when it wasn’t. Not that there wasn’t huge sums of money spent on the event, but that Larry and the BMORG didn’t spend the entire year talking about money, asking for money, justifying the money, etc. Larry, how much time have you spent this year not thinking about money? The Board has noted your concerns and is pleased to announce that the “Medici.com Radical Self-Expression Zone brought to you by PatronEyez.org” will be open on playa from 11:00 AM to 3:00PM daily on the 7:30 plaza. Within the comfortable confines of this sponsored 4′ by 4′ free speech zone, you will be free to radically express your frustration well out of earshot of any plug-and-play Patron who might be offended by your opinions. Brought to you by your friends and masters ay PatronEyez.com. Now back to your hole, plebe. This is a reply to Chowski. Given the tone of your post, I suspect you may have little experience as a working artist. I have worked intimately with hundreds of artists over a span of thirty years, and I’ve yet to meet one who wouldn’t gladly accept help from most patrons – especially if that patron wasn’t domineering and allowed them to maintain creative control of their work. Hi Larry. I apologize if my “tone” confused you. I have in fact been a performing artist since childhood, a professional from the time I graduated college until my mid-thirties (off-Broadway to Carnegie Hall), and a theme camp leader since 2009, building art, running a bar, and acclimating virgins to the standards of our community without even having any entitled, moneyed parasites-customers, sorry, patrons at all! Perhaps you have confused my “tone” with “a conversation you are not interested in having”. I get it. There are many ideas with which I have no interest in engaging. Maybe you’ve simply been surrounded by like-minded Bay Area people who share your vision but have been removed from the realities of small-camp and small-art organizing for so long that neither you nor they even remember what that was like, and have become increasingly interested in catering exclusively to the Sherpa and Wristbands crowd. Hey, it takes all kinds to make a great burn. Except the RV cities. It never takes RV cities. The good news is, the “Medici.com Radical Self-Expression Zone brought to you by PatronEyez.org” will be open for expression of ALL ideas. (Ideas expressed within the Radical Expression Zone do not necessarily reflect those of Medici.com or PatronEyez.org.) So please feel free to come by, and Radically Express yourself at this cozy installation after signing a simple 40-page release/user agreement! (Anything you say or do within the Radical Self-Expression Zone may be recorded and used in perpetuity without your knowledge or compensation. “Radical Self-Expression Zone” is a registered trademark of PatronEyez.com. Go to PatronEyez.com/PatronsPatronize for more info.) See you there! Nandro, we need to condition how money behaves and by doing so, drive a global Renaissance. Makes sense to me. Over a career of creating privately funded monuments, many in public spaces I know that funded art beats the alternative. Have you ever made your living creating art? It’s different when you don’t have a day job paying the bills. For every wealthy art patron on the playa there are far too many wealthy yahoos who think they own the city. Like the jackass who had a six foot long, LED covered, powered hoverboard who yelled “Get out of my way !” as he tried to turn it around on a crowded esplanade. Follow the money and often it leads to privileged idiots with no manners. Plug n play camps behind a wall of RVs and sparkle pony only art cars are just the tip of the iceberg. ! The Renaissance was essentially the result of a few enlightened individuals empowering enlightened artists, engineers and architects. Today, crowdfunding is fueling the rise of enlightened projects that a critical mass of enlightened people want to see happen. To condemn money in either case is flawed for two reasons – 1) The results are seen as positive; 2) If not money, then some other tool or medium centered around social capital or political capital would have replaced it anyway. What’s incredibly exciting is the idea of combining the two aforementioned ideas: crowdfunding a new renaissance, by the people for the people, in partnership with enlightened artists, engineers, architects and philanthropists. What’s sad is that some burners who misunderstand or manipulate the decommodification principle to uphold their own values will condemn other burners who want to be at the forefront of such a movement. That’s more radically non-inclusive than decommodified. I want to be at the forefront of such a movement. Well said, Catalyst. But remember, crowdfunding doesn’t work in every circumstance, nor does Honorarium funding. For some artists I’m proposing Fundiversify, or funding public art via private ownership. Playa Artifacts back their own investment as their monetary value accrues with public sharing in the Burning Community. I’m hoping this pilot project kicks in early enough to drive our Timeless Installation this year, so click my name, read and share, dear readers. I for one am encouraged by Timeless in his efforts to bring his term “Fundiversify” to the forefront of the new Renaissance movement. Like a perpetual motion machine created as a model for us all to follow and become a part of. Having attended South Lake Tahoe’s Beach Retreat, “Blizzard Fest, a pray for snow,” I’ve witnessed this event in the default world blend both Burner principles and public funding successfully. It offers an opportunity for everyone, artists and patrons to contribute and create at the same time. Excited to watch the enthusiasm grow as heads (consciousness) turn. Especially Larry Harvey. Not a paid endorsement. I just hope that the plug and play bunch in the million buck motor homes along with the rich techies tire quickly and the novelty of going to BM fades and us ordinary people that started it all take back what was in the beginning a LOT of fun and un crowded big space Such rude people most of them are .